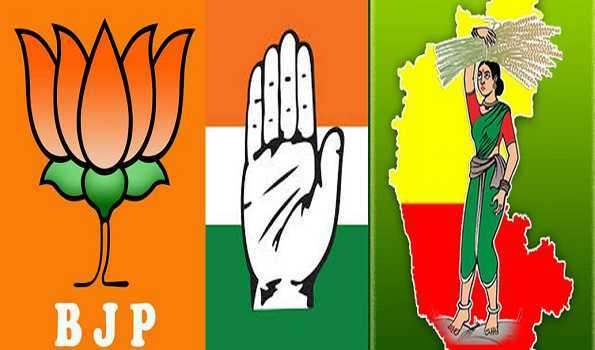 Bengaluru: Exhibiting the power of joint fight against the BJP, Congress and Janata Dal(S), coalition Government in Karnataka, on Tuesday made major inroads into BJP territory winning two out of three Lok Sabha seats and both the Assembly segments which went to by-elections on November 3. While Congress scored a major win in Ballari wresting the LS seat from BJP in its bastion, also won from Jamkhandi Assembly segment, JD(S) retained its LS seat of Mandya and Ramanagara Assembly segment. BJP had to be content with the solitary win in Shivamogga parliamentary seat. The win for the coalition partners in Ballari Parliamentary seat, a BJP stronghold of the BJP, where U S Ugrappa of Congress defeated J Shanta of BJP by a thumping margin of 2,14,826 votes was the biggest win for the coalition partners. Congress thus ended the nearly two decade BJP reign in mineral rich district. Meanwhile, JS(S) easily retained the Mandya LS segment as its candidate L Shivarame Gowda defeated BJP candidate Dr Siddaramaiah of the BJP by a record 3,24,925 votes. BJP retained its stronghold Shivamogga when B Y Raghavendra, son of BJP state president and former chief minister B S Yeddyurappa, won the seat by a short margin of 52,148 votes. In the two Assembly seats, Congress nominee Anand Nyamagouda defeated Srikant Kulkarni of BJP by a comfortable 39,480 vote margin in Jamkhandi, while in Ramanagaram Anita Kumaraswamy steamrolled BJP candidate Chandrashekar by a whopping 1,09,137 votes margin. Incidentally BJP had conceded its defeat in this segment even before the polling as its candidate had withdrawn from the contest two days before the by-polls.Former Chief Minister and Congress leader Siddarmaiah in a tweeter message hailed the Congress victory in Ballari saying that the voters of the segment had meaningfully celebrated NarakaChaturdashi/Deepavali festival today by moving from darkness towards light ending the BJP reign in the segment. KPCC President Dinesh Gundurao in his reaction through tweeter said it was a resounding win for Congress-JD(S) combination in the State and a 4-1 thrashing to BJP. People have rejected the negative politics of BJP in Karnataka and the abject failure of Modi government at the center in addressing people's issues. I congratulate all Congress winners. He said Congress-JD(S) combined fight in the election has been a great success.